November 16, 2016, New Delhi, India: Despite significant inconveniences, pain and loss of productivity, support for the Government’s demonetization program has increased during the last week. A portion of the citizens who were unsure of such a demoentization program earlier and the ones who did not support it are now lending support to the program. In a related survey, 44% of the same citizens outlined that they found the ATMs non-functional, yet most are in support of this scheme by the Government of India and feel that long term benefits will outweigh the short term pain. LocalCircles, the citizen engagement platform was the one that ran the poll on currency demonetization from Oct 31st-Nov 8th . 78% citizens had indicated they supported the discontinuation and color change of 500 and 1000 rupee notes in this poll. The Prime Minister announced the demonetisation scheme on Nov 8th via an address to the nation. 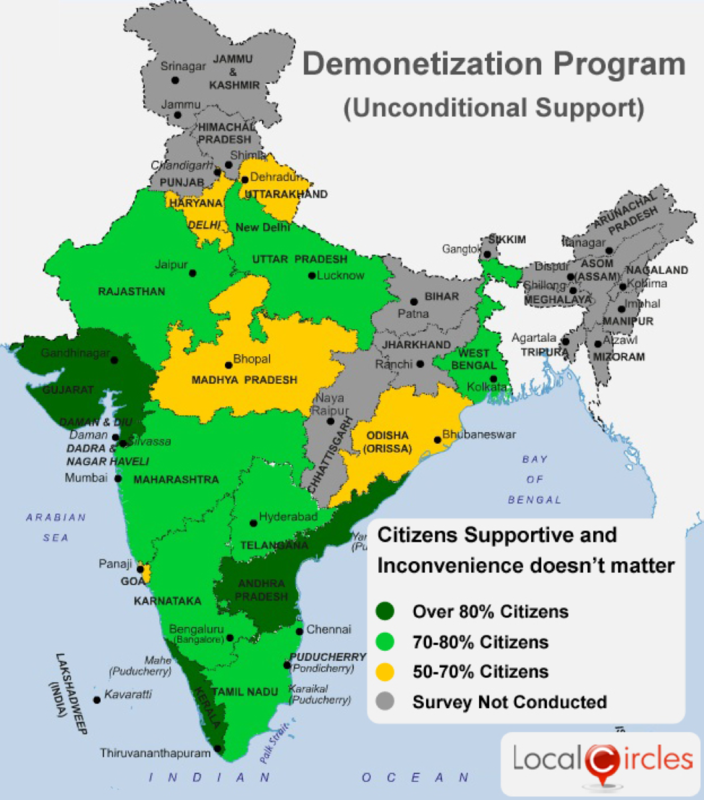 In a follow on poll conducted by LocalCircles after a week, on Nov 15th, 79% citizens are still in fulll support of the currency demonetization program despite the inconveniences its causing. Another 18% said that while they support it, it is causing pain to them. The remaining 3% citizens do not suppport the program. The survey was conducted amongst 10,000 citizens from across 200 cities of India. 68% of the participants were male while 32% of them were females. 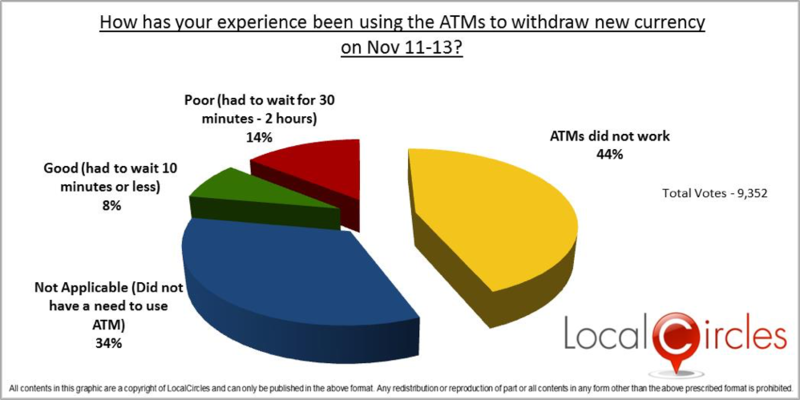 On Nov 14th, in a different survey conducted on the platform, 44% of the same citizens said that ATMs were non-functional in their area. The survey was also done seperately in 13 states of India in the online local communities that LocalCircles has there. The results in these states are also somewhat similar in terms of overall support except that a higher percentage of citizens are experiencing pain and incovenience in some states as a result of the program. Enclosed is a map with support level by states and a map highlighting the magntitude of inconvenience.